Learn more about this product and add it to your cart. 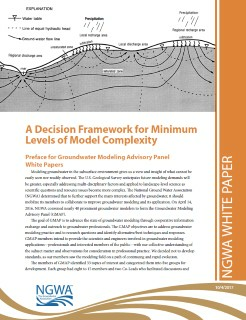 Description This white paper is a compilation of five papers drafted by the NGWA Groundwater Modeling Advisory Panel over the span of a year. • How should decision-makers consider groundwater modeling in project development and solution? • How should the complexity of the subsurface be considered in developing groundwater models? • What consideration should be made in moving from simple to more complex model development? • How can uncertainly be included in modeling to inform decisions for groundwater supply and remediation? • What approaches can be followed to address interaction of groundwater/surface water decisions? Each paper covers a specific topic of current interest in groundwater modeling in-depth and as a set of five papers provides a broad perspective on the practice of groundwater modeling today. The Groundwater Modeling Advisory Panel drafted the five papers and conducted peer review on the papers from June 2016 to June 2017. The papers were approved by the NGWA Board of Directors in October 2017. This is a downloadable item. A link will be provided on the confirmation page and on the receipt sent to your email address. Please select DOWNLOAD as the shipping method if this is the only item order.